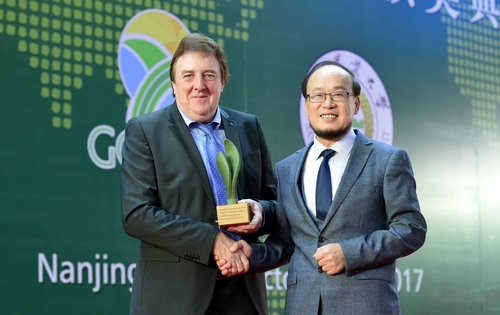 Professor Dirk INZÉ, Director of the VIB – Ghent University Center for Plant Systems Biology, Belgium, was awarded the ‘2017 GCHERA World Agriculture Prize (WAP)’ at a ceremony at Nanjing Agricultural University on Saturday 28 October. 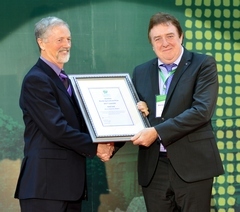 Professor Dirk INZÉ becomes the 5th GCHERA Laureate. This award recognizes Dirk INZÉ’s exceptional and significant life time achievements in the field of the molecular systems that govern plant organ growth, biomass productivity and seed yield. 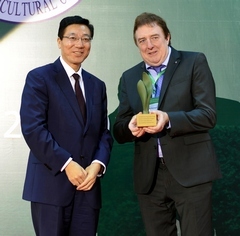 He was presented with a Certificate by John KENNELLY, President of GCHERA, and with the GCHERA WAP trophy by SUN Qixin the President of the China Agricultural University. John KENNELLY presenting Dirk INZÉ referred to his many seminal contributions to our understanding of cell cycle regulation in plants. He was the first to identify and functionally characterize numerous core components of the plant cell cycle machinery. Dirk INZÉ realized his research could benefit crop growth and improve yields. To validate this concept, he founded the spin-off company CropDesign in 1998. The presence of this company at the Technology Park of Ghent University also attracted other agricultural biotech companies to settle on campus, including Bayer and Syngenta. Currently, nearly one thousand people are working on basic plant biology and crop improvement at the Agro-Biotech campus in Ghent. Dr Julia BAILEY-SERRES, Professor of Genetics at the University of California, Riverside recognises “Professor INZÉ extraordinary track record of coalescing ideas and innovators to advance research that addresses critical questions. This has involved his long term leadership … in the plant biotechnology industry. Through his discoveries and leadership, fundamental discoveries that are key to plant growth and development are being effectively translated to crops, which are essential for a promising future of mankind”. Professor Ron MITTLER, Director of the Genomics Center at the University of North Texas states “Dirk continues to have an immense impact on how the public, scientific community, and industry view basic plant biology research, and the many ways in which the field of plant biology can contribute to the improvement of crop yield and crop tolerance to drought, heat and other environmental stresses that impact agricultural production on a global scale. His scientific, educational and public work and leadership in these fields are extremely important to the scientific community as a whole, as well as to our society”. See more details of Dirk INZÉ’s outstanding achievements. The video below features ZHOU Guanghong, GCHERA Vice President and President of Nanjing Agricultural University, presenting further information on the World Agriculture Prize, and exciting new developments for the Prize.